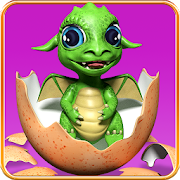 Dragon – your virtual pet. Grow your own dragon and enjoy your new friend. The game starts with an egg. Take care of it and provide appropriate temperature. You can also play some mini games to let the dragon hatch faster. After a short time a beautiful, little dragon will hatch. Look after it and help it grow. This lovely pet needs to be taken care of every day. Feed it, clean it and don’t let it feel lonely. Make your virtual dragon smile all the time. -Change the appearance of your virtual dragon – there are a lot of different hats, glasses and 3D T-shirts to choose from. You can also change the colour of your dragon’s skin and eyes. -Decorate each room at its home – there are numerous types of furniture, decorations, wallpapers and floors to choose from. There is all you need to furnish a cosy place. Flappy Dragon – touch the screen and avoid obstacles. – Stroke and touch the dragon and you will see how it can react. In case of any problems with the effect of dragon – virtual pet, instead of giving us the negative opinion, please send us an e-mail and review briefly the problem. It will help us to solve it in the next updates of app. Dragon – virtual pet is free but contains ads inside app. Revenue from advertising will help us to create new attractive wallpapers and applications. All permissions are required only for advertising and are supported by trusted vendors.